We did spend a good amount of Easter Sunday in the car, returning from a splendid weekend with friends in Austria. The Big Boy was handling all the driving, which I thoroughly enjoyed, as he is a good driver and fully ready to start driving all by himself starting next Thursday, when he turns 18. Sitting next to him, I could limit my supervisory duties to an occasional checking glance to the speedometer (German Autobahn does not have a speed limit), and used the time to watch an awesome video class on Kelby Training that I’ve downloaded to my iPad, “A Day with Jay Maisel”, where Scott (Kelby) and Jay walk the streets of New York during this two hour video, and Jay shares his wisdom from years of shooting Street Photography in the Big Apple. An excellent intro for our upcoming NYC trip. As there was no real time for my own photography yesterday, I turned to the archive and pulled out this iPhone image I took of an Easter fountain in neighboring Altdorf (the town where Big Boy goes to school). 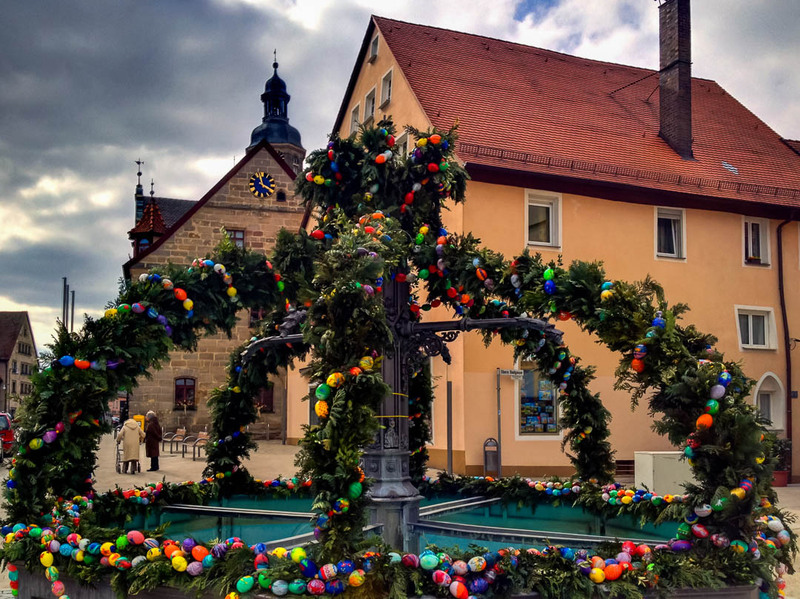 The decoration of fountains with eggs and tree branches is an old tradition in our region, it is fun doing a Easter outing, driving from village to village to look at the magnificent displays. The weather in the shot was exactly how it was yesterday, cool and cloudy, with an occasional shower and an ensuing glimpse of the sun. Today, Easter Monday, the weather is glorious, and in Germany we still enjoy a free day. The Significant Other, Big Boy and I have prepared the Easter lamb that is not simmering in the oven, to be enjoyed later when family comes over for the Easter dinner. Oh how wonderful they still do theses traditions! Good your safely back home, Amy! I’m sitting at Frankfurt Airport waiting for our flight to JFK for a week in the Big Apple. Aren’t we blessed to see all those places? So blessed!! Enjoy the Big Apple!! Teenage drivers! Nervewracking at times, but so great for everyone when it happens. We start them too early here in the US I think…18 is a much more appropriate age! Glad you had a happy Easter! Thanks for your kind words. Our son dropped us of at the airport this morning (we head to NYC for a week). I assume he is enjoying to have the car for himself for a full week 😉 First time he can drive to school. Happy (belated) Easter, Marcus! Perhaps by next year you’ll be confident enough in Big Boy’s driving that you’ll take a few photos through the window en route to the celebration. This one is a lovely stand-in, though. My best wishes to you and yours. Hope you enjoyed your roast lamb dinner Marcus, we had the same family meal yesterday along with plenty of chocolate! My 17 year daughter is learning to drive with me in the passenger seat often saying “slow down, slow down, SLOW DOWN!”. And completely unrelated to this, I have become a more religious person lately. 🙂 Thanks for you comment !! Loved it! Wishing you and yours a great (what is left of it) Monday.